Tiffany & Co Bridal Shower Cupcakes! Ladies celebrating a bride with Tiffany & Co. cupcakes - what more can one ask for? Underneath you have honey jasmine cupcakes and chocolate rose cupcakes. Yum! 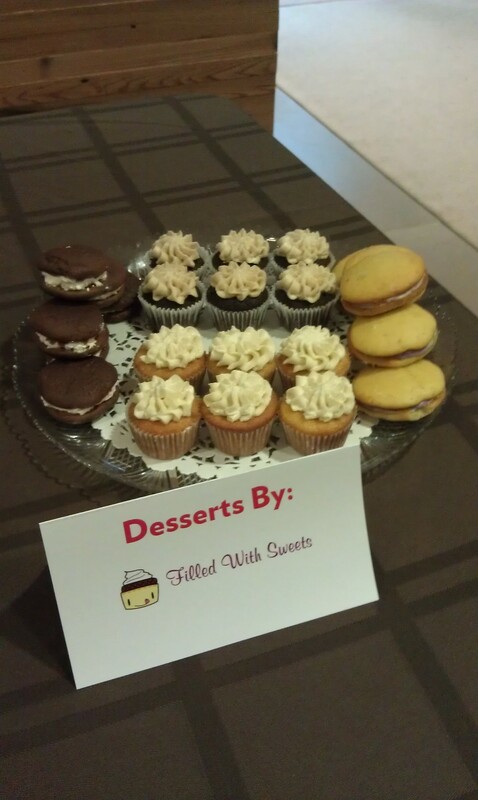 If you're interested in having something like this at your event, reach out to terry@filledwithsweets.com! When I got this order, I knew it was going to be something fun to make. The cupcake toppers signified three decades of greatness: first decade was represented by the Sheffield Wednesday Football Club, the second decade was represented by the London beefeater, and third decade was represented by the yellow NYC taxi cab. The cupcake toppers rested on top of chocolate rose cupcakes filled with raspberry jam, which provided a great personal touch for the celebration gift! What better way to welcome a baby boy than to have a well-dressed man themed party? Our cupcakes were beautifully adorned with cute decorations of this sort - full of mustaches, bowties and ties! To get your hands on custom cupcakes, reach out to terry@filledwithsweets.com for more information! Springtime is coming, albeit slowly, in New York which kicks off the season of baby and bridal showers! Recently we had a client order a number of bear-themed baked goods, all customized, for a beautiful baby shower! Below showcases the bear-themed cupcakes, whoopie pies, and favors for the party. We also made rattles and pacifier cake pops to complete the baby shower theme. For more information, email terry@filledwithsweets.com! 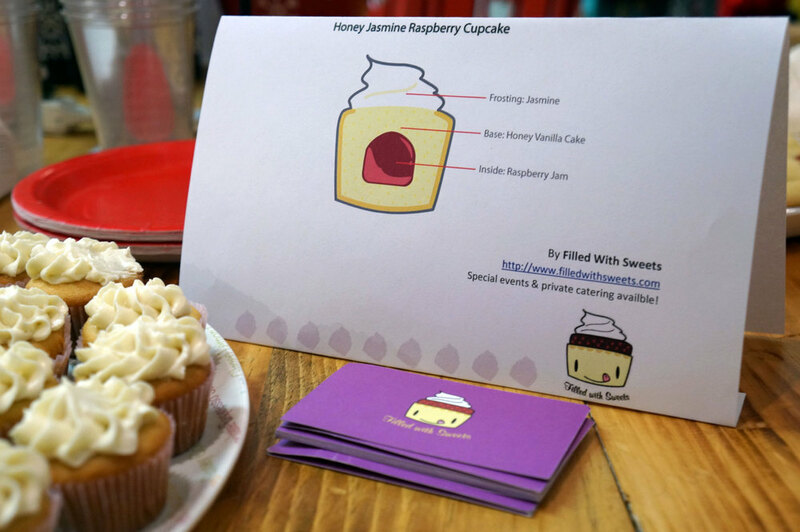 For Teeny's bridal shower, these were honey jasmine cupcakes filled with raspberry jam. A popular flavor and hit for the ocassion! Ebby is one lucky man. When my friend requested for Hello Kitty themed cupcakes, I happy obliged. She placed an order for two delicious flavors - chocolate rose and chrysanthemum tea - with the addition of the bride-to-be's name spelled on top. After brainstorming how to combine the use of letters and Hello Kitty, I began the project. Cuteness overload! I started with baking the cupcakes and then worked on the decorations separately. I started by cutting out a Hello Kitty picture and made it my template. After rolling out the white fondant, I carefully cut out the shape of Hello Kitty. After that I added red coloring to a small portion of white fondant for her bows and letters. With the use of some alphabet stencils, I cut out the shapes of letters and placed "glued them" (using buttercream frosting) to the other parts to fully assemble the head. The final touches included using black royal icing to mark as whiskers and bow details. Once the Hello Kitty heads were properly put together I put them on top of the cupcakes. All done for everyone to enjoy! Qucena's and Daniel's Wedding - Cookies & Mini Whoopies! The couple - Qucena Hui and Daniel Yao - got married this past weekend on July 20th in the beautiful Medinah Country Club. I had the honor of providing some baked goods for their dessert table. Being that Qucena is the biggest fan of purple, I incorporated purple as much as I could to the desserts without taking away from the wedding theme. Pictured in the gallery are frosted sugar cookies in shapes of the bride, groom and wedding cake with a message. Mini Ovaltine whoopie pies were provided to the guests as well, packed in a small cellophane bag with purple ribbon. All the guests seem to have enjoyed the take-home desserts since there were none left by the end of the night! If you are interested in having customized cookies at your wedding, please fill out a Contact Us form or email terry@filledwithsweets.com! Summer is in full swing with baby showers galore! With the babies close to being born, everyone is ready to eat their sweets on - pictured are two different baby showers. One features our regular-sized cupcakes in three different flavors (matcha, chocolate rose, black sesame) and the other has customized cupcakes (same flavors) with a blue bear on top using fondant and royal icing. For more information on custom orders, please fill out a form on the Contact Us page or email your question to terry@filledwithsweets.com. Happy eating! 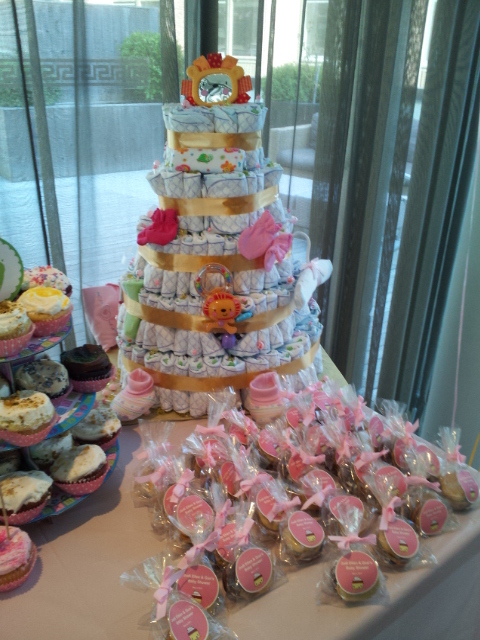 On a beautiful May afternoon, we celebrated Judi Ellen & Guo's baby with delicious treats from Filled With Sweets! Baby pinks and bright yellows covered the table with various desserts and favors. Each favor had a mini yuzu-lemon and ovaltine whoopie pies! 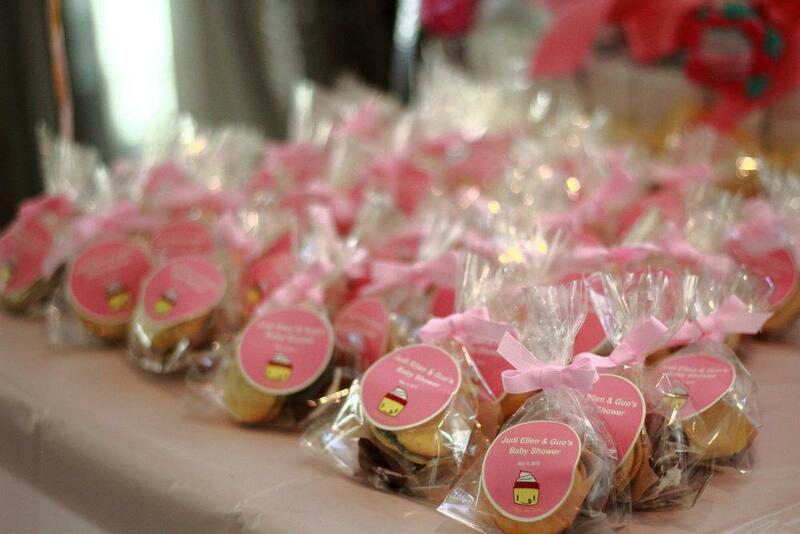 For more information on providing sweets and favors for an event, email terry@filledwithsweets.com! Shanghai Glamour: New Women 1910s-40s. For their VIP Opening Reception, they chose to have Filled With Sweets cater at this wonderful event! They had the following: Ovaltine mini whoopie pies, yuzu-lemon mini whoopie pies, honey jasmine mini cupcakes and chocolate five-space mini cupcakes. For more information on catering and private events, feel free to fill out a Contact Us form or email terry@filledwithsweets.com! TAP Night Market ushered in a nice spring night with the introduction of a traditional Taiwanese night market. Having the various food vendors, games and drinks provided all guests with a great night! We featured the NEW cupcake flavor for this season - Chrysanthemum cupcake with spiced Asian pear filling with an orange frosting - and the yuzu-lemon blueberry whoopie pie. Where can you find them? Email terry@filledwithsweets.com or Contact Us for more information! As spring approaches, it looks like there are more fun events going on in NYC. As a recap, we were invited along with several other vendors to serve up delicious food and treats to the masses. Pictured is me and Al, with the stand all ready for people to take springtime desserts and plus it was Easter themed! Thanks AsiainNY for your photo! As you see here, the popular flavors for the spring / summer - honey jasmine mini cupcake and yuzu-lemon mini whoopie pies. DELICIOUS! It was a fun event and definitely looking forward to being at more events to come. Keep your twitter accounts ready (@filledwsweets) or Facebook feeds streaming as we continue post where we'll be next! As spring approaches, that means more fun events around the city! 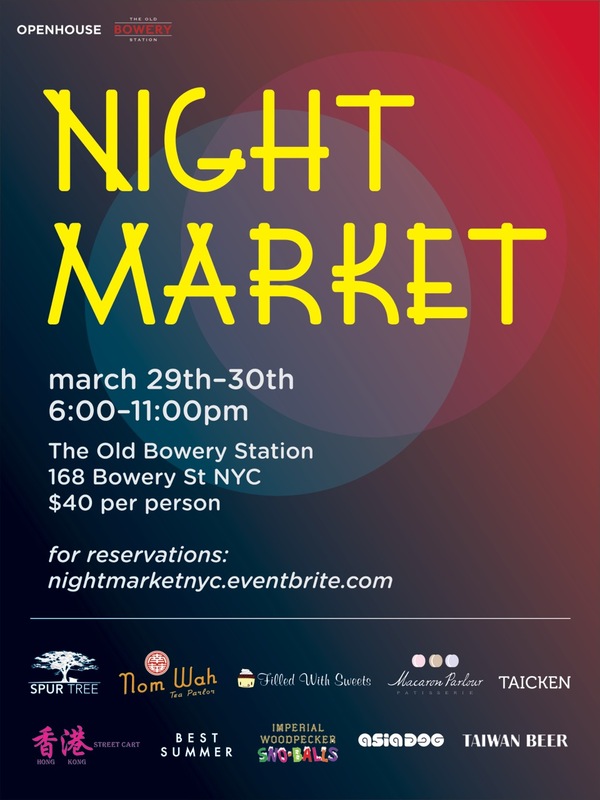 In two weeks, Filled With Sweets will be at a Night Market event at the Old Bowery Station. There will be a lot of great vendors there so be sure to get your tickets now! 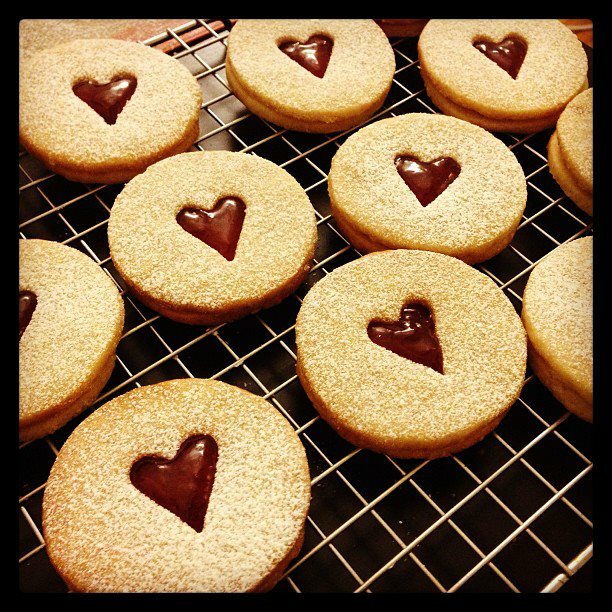 Valentine's Day is around the corner and it looks like we are creating romantic and delicious baked goods! Below is a chocolate cupcake with a strawberry jam filling. The frosting is a strawberry rose flavor. Can we say delicious? Yup - and you can get these at Nolita Mart this week and order them for Valentine's Day too via email or phone (917) 599-8683! Betola Espresso Bar (514 E 6th St, btw Ave A and B) in the East Village is carrying our cookies! Currently there are three flavors so go check them out! Grab some cookies and get some delicious coffee while you're at it! 'Tis the Season for Christmas Cookies! It's that special time again when we are looking at Christmas cookies - one of my favorites is the hazelnut linzer tarts with strawberry jam. They're pretty and great for the holiday season. Can we say yum! Also I made some matcha redbean shortbread that satisfies the tea enthusiasts out there! Christmas time is definitely a tasty and delicious holiday season. If you're interested in ordering any of these cookies, contact us by filling out this easy form. Townhouse Shops: Shopping with Sweets! Townhouse Shops provided their guests with a great shopping experience - beautiful clothes, delicious mini cupcakes, what more can a girl ask for? For more information on having Filled With Sweets cater your event, fill out the form on our Contact Us page! What can be more fun than presents and little desserts? Mini whoopie pies - yuzu lemon with blueberry cream chesse - and mini cupcakes - black sesame! Delicious favors for a cute and fun-filled event! Margaret Cho's & Nick Chan's Wedding! Hurricane Sandy definitely hit the east coast with a force, but not enough to stop Margaret Cho's & Nick Chan's wedding that happened this past Saturday. This couple celebrated this momentous occasion in NYC and asked Filled With Sweets to provide wedding favors for their guests. Each person received two snickerdoodle whoopie pies, perfect for the fall season and a popular flavor! Each whoope pie was placed in a clear cellophane bag, with a small piece of parchment paper in between. A customized sticker was created for them, and then each bag was wrapped with a satin purple ribbon. Beautiful and delicious! Who can resist the taste of Fall? Many of us love how the leaves change, mid-60s temperatures where you switch from skirts to pants, and the onset of the pumpkin season. Luckily we have delicious snickerdoodle pumpkin whoopie pies available for purchase - $2.00 / each! Fill out a form to order some for your next event! Check out the full article at NY Mag!